Metro New York is the massive metropolitan area around New York City in New York state, Connecticut, and New Jersey. It is both the biggest and wealthiest metro area in the United States. Bridgeport - The largest city in Connecticut. Hoboken - An old city on the Hudson with awesome view of Lower Manhattan. Jersey City - Just across the Hudson River from Lower Manhattan, home to Liberty State Park, where ferries leave for Ellis Island and the Statue of Liberty. New Haven - Perhaps best known as the home of Yale University. New York City - Possibly the most well known and celebrated city in the world, New York is a city of towering skyscrapers, ethnic diversity, international corporations, and incomparable culture. Newark - New Jersey's largest city, home to Newark Liberty International Airport, the New Jersey Performing Arts Center, Newark Symphony Hall, Newark Arena, and the Newark Museum. Norwalk - home to trendy SoNo and The Maritime Aquarium. White Plains - The seat of government for Westchester County, its downtown has recently been redeveloped with upscale housing and retail. Yonkers - Undergoing major development along Hudson River, but Getty Square, its traditional center only a few blocks to the east of the River, is down-scale. The Palisades - Majestic cliffs rising sharply on the western bank of the Hudson River with numerous viewpoints, trails and camp sites. Rye - Home to Rye Playland, the country's only government owned amusement park. Metro New York is served by three large airports in New York City (IATA: NYC for all airports) which is well connected by air with flights from almost every corner of the world. John F. Kennedy International Airport and Newark Liberty International Airport are large international airports while LaGuardia Airport is a busy domestic airport. All three airports are run by The Port Authority of New York and New Jersey . There are also several small airports in the region. John F. Kennedy International Airport (IATA: JFK)  is in the borough of Queens in the eastern part of New York City. Many international airlines fly into JFK and it is a major international hub for Delta Air Lines (Terminals 2 and 3) and American Airlines (Terminal 8). Air France and Lufthansa (Terminal 1), British Airways (Terminal 7), and Virgin Atlantic (Terminal 4) each provide several flights daily into JFK. JetBlue, a large low-cost carrier, occupies Terminal 5. A free AirTrain connects the terminals. Always make sure you know which terminal your flight arrives at or departs from. Left luggage services are available in the arrivals areas of Terminal 1 and Terminal 4 and cost $4-16 per bag per day, depending on size. There are plenty of ATMs (almost all charge a small fee). Luggage trolleys are available either for a fee of $3 in Terminals 2, 3, 7, 8, 9 and all departures and free in Terminals 1 and 4. There are many hotels of all levels close to the airport and most run shuttle buses to/from the airport. Newark Liberty International Airport, 1-800-EWR-INFO, (IATA: EWR) is located in Newark and Elizabeth, New Jersey. The airport has three terminals labeled A, B, C. Terminal C is the home of Continental Airlines which has a major hub at Newark. Most other international airlines use Terminal B while domestic flights are from Terminal A but there are exceptions, so check your terminal before you head for the airport. LaGuardia Airport (IATA: LGA)  is a smaller, older airport in Queens, providing many of the domestic services for the area including the frequent shuttles to Boston and Washington, D.C.. Direct flights are available to all large and most small airports east of the Mississippi, with a few international flights to Toronto and Montreal. The Marine Air Terminal, currently the terminal used by Delta Airlines for shuttle services to Washington D.C. and Boston, is one of the oldest, still-in-use, airport terminals in the world. Long Island MacArthur Airport (Islip Airport) (IATA: ISP) , located in Ronkonkoma (Town of Islip) on Long Island, is served by Southwest Airlines, a major discount carrier in the US. US Airways has a minor presence at the airport. The Long Island Railroad offers a discount package for MacArthur Airport travelers on its website . Westchester County Airport (IATA: HPN) , near White Plains, NY, is served by several airlines. It is most convenient to Westchester County and adjacent areas of Connecticut. Metro New York is also served by Teterboro Airport (IATA: TEB), in Teterboro, NJ, though this airport is used primarily for general aviation and receives no commercial flights. Amtrak, 1-800-USA-RAIL (1-800-872-7245), , operates from New York Penn Station, directly under Madison Square Garden, on 34th Street between 7th & 8th Avenues. Popular trains leaving during rush hours can fill up quickly; it is a good idea to make reservations online , or via phone, and pick up your ticket using a credit card or your confirmation number at one of the electronic kiosks located throughout the station. On some of the non-business routes, for example New York to Montreal, Amtrak actually takes more time and costs more money than taking the bus or renting a car. Check and compare schedules and prices before booking. Amtrak's Acela  express train provides regular fast commuter service between major points along the east coast such as Washington, D.C., Boston, Baltimore, Philadelphia, New Haven, and Providence. Amtrak services are also available to points along the East Coast down to Florida, to points between New York and Chicago, including Pittsburgh and Cleveland), to New York State including Albany, Rochester, Buffalo and Niagara Falls, and to Toronto and Montreal in Canada. Service to California takes 3 days and requires a change of train in Chicago. Amtrak's ClubAcela , located near the big security desk in Penn Station, offers complimentary drinks, wi-fi access, newspapers and magazines, and clean bathrooms. Access to the club is granted to travelers with sleeper tickets, First Class Acela tickets, Amtrak GuestRewards SelectPlus membership, or Continental Airlines BusinessFirst tickets for same-day travel, and Continental Airlines President's Club members..
Metro New York is served by three commuter railroads. Long Island Rail Road (LIRR)  operates between New York Penn Station and Long Island with New York City stops at Jamaica Station, Long Island City, and Hunters Point in Queens as well as Atlantic Terminal station in Brooklyn. Metro-North Rail Road (Metro North)  operates between Grand Central Terminal and points north and east of the city all the way to Connecticut. Trains also stop at the Harlem station on 125th street and Park Avenue in Manhattan. The New Haven line serves cities along the coast with branch lines to Danbury and Waterbury. The Hudson Line serves points along the Hudson River to Poughkeepsie. The Harlem Line serves Westchester, Putnam, and Dutchess Counties to Pawling and Wassaic. New Jersey Transit  operates between New York Penn Station and points in New Jersey. The Northeast corridor line goes to Princeton and Trenton. Services are also available for points along the Jersey Coast and, with a transfer in Secaucus, to points north of the city (in New Jersey and New York State west of the Hudson). Naturally, Manhattan possesses the lion's share of the landmarks that have saturated American popular culture. 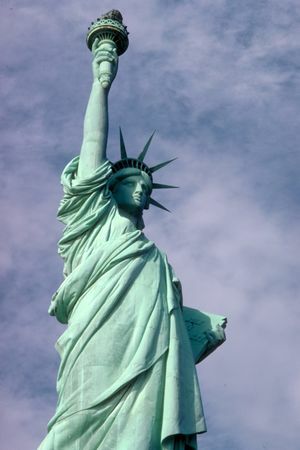 Starting in Lower Manhattan, perhaps the most famous of these landmarks is easy to spot - the Statue of Liberty, a symbol of the nation standing atop a small island in the harbor, and perhaps also the most difficult attraction to access in terms of crowds and the long lines to see it. Nearby Ellis Island preserves the site where millions of immigrants completed their journey to America. Within Lower Manhattan itself, Wall Street acts as the heart of big business being the home of the New York Stock Exchange, although the narrow street also holds some historical attractions, namely Federal Hall, where George Washington was inaugurated as the first president of the United States. Nearby, the World Trade Center Site is undergoing construction of a memorial to the victims of the September 11th terrorist attacks. Connecting Lower Manhattan to Downtown Brooklyn, the Brooklyn Bridge offers fantastic views of the Manhattan and Brooklyn skylines. Moving north to Midtown, Manhattan's other major business district, you'll find some of New York's most famous landmarks. The Empire State Building looms over it all as the tallest building in the city, with the nearby Chrysler Building also dominating the landscape. Nearby is the headquarters of United Nations overlooking the East River and Grand Central Terminal, one of the busiest train stations in the world. Also nearby is the main branch of the New York Public Library, a beautiful building famous for its magnificent reading rooms and the lion statues outside the front door; and Rockefeller Plaza, home to NBC Studios, Radio City Music Hall, and (during the winter) the famous Christmas Tree and Skating Rink. Near the Metropolitan, in the Upper East Side, is the Guggenheim Museum. Although more famed for its architecture than the collection it hosts, the spiraling galleries are ideal for exhibiting art works. Also nearby is the Whitney Museum of American Art, with a collection of contemporary American art. In Midtown, the Museum of Modern Art(MoMA), holds the most comprehensive collection of modern art in the world, and is so large as to require multiple visits to see all of the works on display, which include Van Gogh's Starry Night and Picasso's Les Demoiselles d’Avignon, as well as an extensive industrial design collection. Midtown is also home to the Paley Center for Media, a museum dedicated to television and radio, including a massive database of old shows. This page was last edited on 19 December 2015, at 15:22.